The Greeley West jazz band performs at Gourmet Grub on Monday, October 15. The Greeley West jazz band had their first performance of the year on Monday, in tribute to the American flugelhorn player, Chuck Mangione. 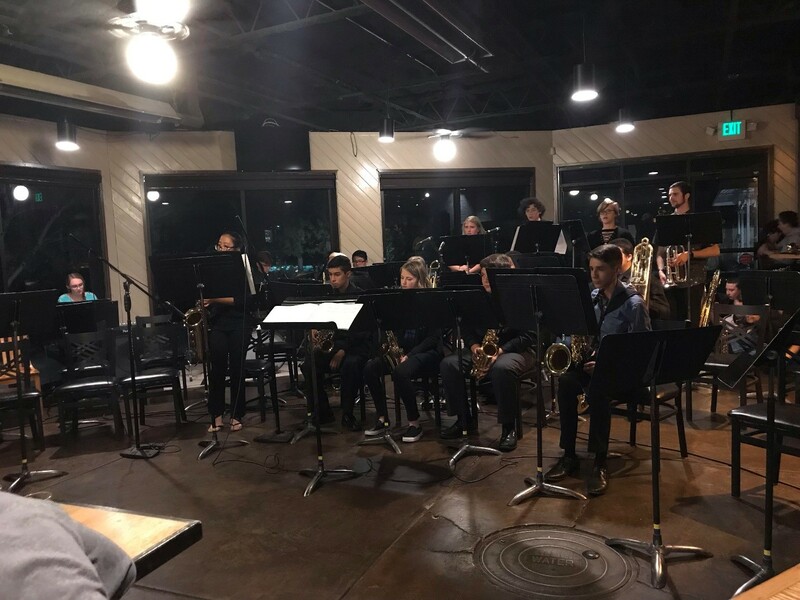 The band played at the Gourmet Grub Scratch Kitchen along with Chappelow and Brentwood’s jazz band. West’s band was third to perform and they played three different pieces. Mr. Chet Arthur chose the Gourmet Grub as a first concert location because the band had done a joint concert with the John Mills Orchestra at the location and really enjoyed it. Mangione helped make the flugelhorn popular, hence Arthur had the original trumpet players play on the flugelhorn due to them both having the same range. Tran didn’t feel too good about her solo. She believes she tightened up and squeaked a lot. She says during a run of 16th notes, she tightened up and ended up going up an octave. She says she was also off time. She does however really enjoy jazz band. She hopes to play in the band next year. “I love it, it’s fun. Playing one genre your entire life then getting to switch it up makes it fun,” said Tran. Tran already had the clarinet as her main instrument and got the chance to play the tenor in August. Elder on the other hand thought his solos were good. “They weren’t the best they could be but they were good, I felt confident,” Elder stated. Elder’s main instrument is the trumpet, but he started playing the flugelhorn last year. He enjoys it because it’s a nice change from the trumpet. He said he would continue to play the flugelhorn. The last piece was a combined piece with all the bands playing together on a piece called “Wizard Wheezes” from the Harry Potter and The Half Blood Prince soundtrack.